Thomas Shu, Ambassador of Taiwan Tea, Co-founder of JT & Tea parent company of ABC TEA, is a third-generation tea specialist from Taiwan, where his family has been conducting tea business for more than seventy (70) years. 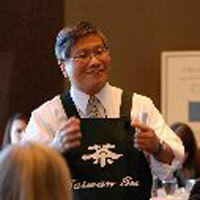 He works with many major tea companies and premium tea importers from Asia, Australia, Europe and the United States. With his proficient expertise and extensive knowledge in teas and the tea industry, Thomas Shu is one of the most popular professional instructors/speakers of the World Tea Expo as well as other international conventions and educational institutes. He is one of the founding members and serves on the board of the American Premium Tea Institute, which has now merged with and known as the Specialty Tea Institute. In April 2007, Mr. Shu received the honorary title of "Ambassador of Taiwan Tea", from the Taiwan Tea Manufacturers' Association in recognition of his dedication and contributions to tea industry. Since 2008, Thomas has been continuously conducting Taiwan Oolongs Study Tours, known as TOST ( www.TaiwanTeaTour.blogspot.com ) , an intensive educational field workshop program for international tea professionals with hands on training, working in various Taiwan Oolongs.